Is China beginning to take anti-submarine warfare seriously? Is China beginning to take anti-submarine warfare seriously? As much as anything else, this would confirm that the PLAN is shifting its focus to developing an overseas expeditionary capability. Anti-submarine warfare in the twentieth century involved two related but distinct efforts: fleet defense and commerce defense. Fleet defense concentrates on the protection of capital ships from subs, and commerce defense on the protection of merchant shipping. The United States and the United Kingdom invented and perfected the commerce defense aspect anti-submarine warfare during the First and Second World Wars, developing methods of managing air, sea, and intelligence assets to bring shooters together with “see-ers.” However, they also worked (perhaps even more successfully) on the fleet defense aspect. No Allied dreadnoughts were lost to submarine attack during the First World War, despite the best German efforts. The European Axis had less use for commerce-protection, but did relatively well with respect to fleet protection. German ships left port rarely, only occasionally coming within range of Allied subs. British submarines in the Mediterranean had some success against the Italians, but the density of air coverage made a sustained campaign difficult. On the other hand, Japanese ASW was disastrous in World War II, on both the fleet and commerce protection sides. Poor air-naval coordination and the lack of dedicated escorts doomed the Japanese merchant fleet in the face of a concerted American campaign. But the fleet also suffered badly, losing a battleship, several aircraft carriers, and numerous smaller ships to submarine attack. The relevance of ASW, thus, depends on a certain degree of fleet maturity. Surface fleets that don’t expect to engage in high seas combat, or to venture beyond protected coastal sanctuaries, need not concentrate on ASW to the same degree as their larger counterparts. But fleets that expect to act in an expeditionary fashion need to develop some form of ASW protection. The Soviet Navy discovered this problem in the 1960s, as it grew from a coastal defense force into one of the world’s largest flotillas. In the mid 1960s, it became apparent that the ever-more-widely ranging Soviet task forces had virtually no defense from NATO submarines. This determination resulted in the construction of the Kresta II and Kara class anti-submarine cruisers, as well as the Moskva helicopter cruisers and Victor nuclear attack subs. As long as the PLAN focused on anti-access rather than expeditionary deployments, it didn’t need to overthink the ASW problem (although it did begin developing some platforms in the 1990s) But now China has big ships, and American, Japanese, Australian, and Vietnamese subs might want to try to sink them someday. Consequently, the PLAN now needs to focus on ASW, and to develop the tools necessary for defeating and deterring foreign subs. 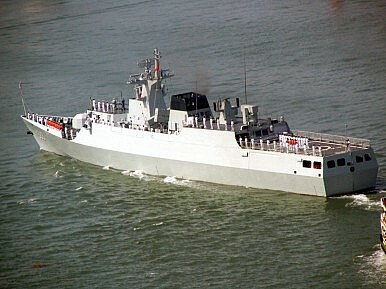 Over the past several years the PLAN has fielded several systems designed to do just this, including the Type 056 Corvette, and the Y-8 maritime patrol aircraft. Most recently, China has developed a system of fixed underwater acoustic sensors. However, most of these systems (including the relatively small Type 056) still depend on proximity to Chinese bases for effectiveness. China’s next major maritime requirement may be a long-range surface warship specialized for ASW, like the Soviet missile cruisers of the 1960s or a variety of different USN ASW platforms. Otherwise, the PLAN may be too fearful of U.S. (not to mention Vietnamese) submarines to deploy its impressive carriers, cruisers, and amphibious warships very far from home. This is especially the case as submarine technology improves. Even the USN may struggle to develop means of finding the latest AIP equipped boats.